Inspired by premium flavour, its rich, creamy taste takes the vanilla flavour to whole new level. 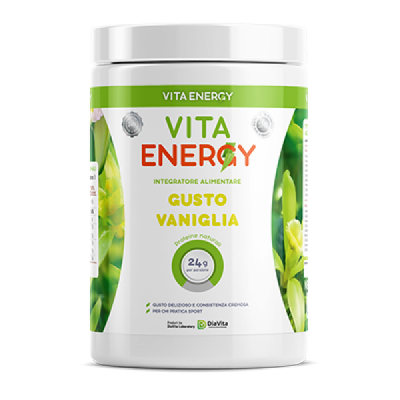 Vita Energy 75% protein formula contains 75 g protein in 100 g of product. It will help to maximize your workout results. Ingredients: Whey Protein Matrix [89% Whey Protein Concentrate, 5% Whey Protein Isolate, 6% Hydrolyzed Whey Peptides], skimmed milk powder, Vegetable oils [Vegetable Medium Chain triglycerides (MCT) from coconut oil], Emulsifier (Sodium carboxymethyl cellulose), flavourings, salt, Sweetener (sucralose), Colour (Tartrazine*). Do not exceed the recommended dosage. Keep out of the reach of children. *Tartrazine: May have an adverse effect on activity and attention in children.